Walt Bickel, a heavy equipment operator, came to the El Paso Mountains as a visitor during the depression and later, after WWII, returned to the area to stay. He found sustainable gold in the area. Not enough to make him rich, but enough to keep him where he could make his home here. 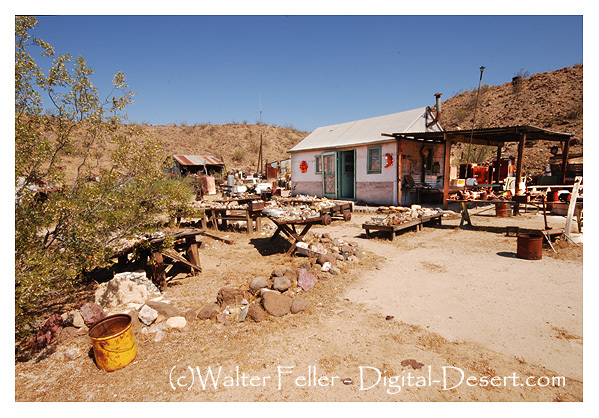 Walt was resourceful, learning to live, in part, off the land as did the Indians and earlier inhabitants. Walt was inventive and over the years created his own machinery to help him process placer gold as well as accomplish other chores and tasks he found necessary. About 1986 the Bureau of Land Management (BLM) aggressively began a campaign to rid the desert of cabins and camps where drug labs may take hold. Bickel Camp came under scrutiny. Walt suffered a stroke just before the inspection and was hospitalized. The BLM determined that there wasn't enough mining activity at the claim to keep the camp from being razed. Walt's son-in-law, Larry O'Neil, had been helping Walt keep the claim active since the mid-60s. With public opinion on his side he managed to stave off the BLM and protect the camp intact until about 2004, when he went to live with his family. Walt never returned to Bickel Camp. He died in 1996.